Recently my husband and I were both working in my home office when I noticed his eyes scanning the ugly, paneled drop ceiling. He burst out laughing in a way that told me I’d read his mind. “But it would be easy and make such a difference,” he said, echoing a line I’ve heard many, many times. I gestured to his tools spread across my desk from the new windows he had just put in. “No more projects,” I said firmly, but I saw him silently planning. When we bought our first house three years ago, we knew we were getting a fixer-upper. It seemed perfect: The issues with the house were cosmetic, but significant enough that we got it at a bargain price. My husband has a background in the trades, so our plan was to renovate the house over time and enjoy a cheap mortgage while we did so. Since then, it’s been one unending project. We’ve skimmed-coated and painted all the walls, replaced the flooring and installed new windows. We gutted the bathroom and refinished most of the kitchen, in addition to myriad other “small” projects like installing new lights, doorknobs and gutters. Along the way, we’ve learned quite a bit. Here’s what I wish I’d known before opting to become Mrs. Fix-It. We’re incredibly lucky that my husband has a background in HVAC, electric and plumbing and is generally skilled with repairs. We’ve had no labor costs, but we’ve still spent a ton on improvements — about a third of what we paid for the house. 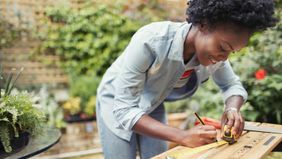 The cost of renovations isn’t just monetary: There’s an emotional toll to living in a home that’s an ongoing project. In the long term, this will (hopefully) be a sound financial decision. Our equity should more than cover the cost of renovations. But in the short term it’s been a financial strain. Since we’re paying for the renovations up front, the cost of projects often negates our lower mortgage payment. Sometimes, we wonder if we would have been better off spending more on a house that needed fewer repairs or getting a renovation loan that rolled the cost of improvements into our mortgage, giving us a higher monthly payment, but less cash out of pocket — something we could use with two small kids and careers still in their early stages. 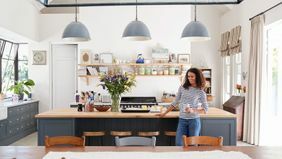 But even when it’s just us, it can be hard to kick back and relax when you’re always noticing drafty windows, peeling paint or ceilings that your husband would love to replace. NOTHING EVER GOES AS PLANNED. EVER. My father-in-law (also a tradesman) likes to joke that when you think you know how long a project will take you should add a number and increase the unit of measurement. One hour to replace that door? Try two days. While it’s not always that bad, I’ve realized that working on an old house is entirely unpredictable. Once you rip up the carpet or pull out a window or start to replace a light you never know what Pandora’s box you’re opening, and how the unexpected complications will affect your deadline or budget. My husband and I hope to use our fixer-upper as a stepping stone to help us get ahead financially. 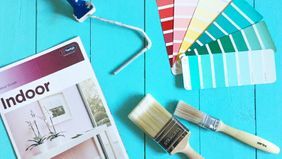 And although we’re both on board with viewing the house as an investment and not our forever home, it can be hard to balance emotional and business decisions when it comes to renovating. We spent more on a nice bathtub because I love to soak, but chose countertops and floors that weren’t our favorite, but are more durable and should hold up to the renter we hope will live here one day. While there are definite downsides to buying and living in a house that needs a lot of work, we believe the benefit of financial security for our family well outweighs the frustrations of unfinished floors. Would I buy this house again? Definitely. Next time, though, I’ll have a more realistic view of buying a fixer-upper.